"This seems like the best, most versatile, and professional data acquisition/processing suite I have seen." "Takes away the tedium of old fashioned data-logging and post processing by combining the two tasks into one. 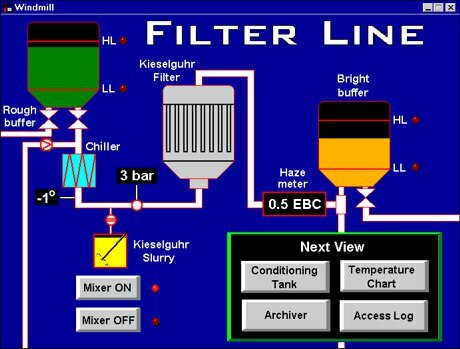 It is possible to run simultaneous measurement, computation and graphical analysis macros in Excel under the Windmill environment." Windmill can communicate with devices over Ethernet, Internet, TCP/IP, Modbus, USB, RS232, RS422 and RS485. A generic serial driver means almost any instrument with a serial port - be it RS232, RS422, RS485, Modbus or TCP/IP - can be linked to the system. The software also communicates with USB and Ethernet devices listed in our on-line shop. Instruments, sensors and signals which have been monitored by Windmill include altimeters, balances, conductivity meters, current signals, data loggers, dial guages, digital indicators, digital thermometers, DMR, encoders, extensometers, flaw detectors, flow meters, flow meters, fluorometers, force gauges, gas analysers, GPS, gyro compasses, high impedance probes, hygrometers, I2C devices, ion gauges, Linear Variable Displacement Transducers (LVDTs) load meters, motion sensors, multimeters, myographs, oxygen electrodes, particle analysers, pH meters, pH probes, PIC microcontrollers, plcs, pressure transmitters, power analysers, power signals, pressure transducers, resistance temperature devices (RTDs), RLC meters, RFID readers, thermoregulators, thermocouples, titrators, solar panel array controllers, sonar, strain gauge bridges and water baths. You can use Windmill to interface many instruments, from different manufacturers. For example, devices from from Acculab, A&D, Advantec, Ashtec, Avery Berkel, B&B Electronics, Biodata, Bruël & Kjær, Campbell Scientific, Dataq Instruments, Daily RFID, Dataq Instruments, Datel, Datataker, Denver, Desoutter, Ecom, Fisher, Fluke, Funaro, Garmin, Geolux, Honeywell, Horiba, Humminbird, ICP DAS, Keyence,LOVATO electric, Love Controls, Linkcom,, Magellan, Maxim, Mettler Toledo, MecMesin, Metrix, Microchip Technology, Mitutoyo, Motorola, Molytek, Newmar, NovAtel, Nu-Metrics, Ohaus, Omnistar, Omron, Orion, Panametrics, Parallax, Parker, Protek, Quantum Logic, Remontec, Retail Sensing, Rockwell, San Jose, Sartorius, SG Brown, Siemens, Sokkia, Sylvac, Telegan, Transcell, Tritech, TTi, TSS, Turner Designs, Varian SenTorr, Veris, Video Turnstile, Voltcraft, Weeder Technologies, Weilheimn, WTW, World Precision Instruments and YSI and many other manufacturers. Many channels of data can be accepted from each instrument. All the equipment monitored by Windmill is configured with one program: SetupIML. This lets you select channels, give them names, specify linearisation and scaling to your chosen engineering units, and so on. In SetupIML you can double-click a channel and change its settings. SetupIML scans the connected hardware and creates a complete default set-up to get you started. When you edit this set-up the menus and dialogues show only those options available with your hardware, so you cannot go wrong. All the details are stored in files and you can create a library of files for different procedures. Your chosen channel names and details are used consistently throughout the Windmill system, even when data is exported to other applications. Log to a new data file at regular intervals, every hour or every week for example. This is useful in continuous, long-term logging. 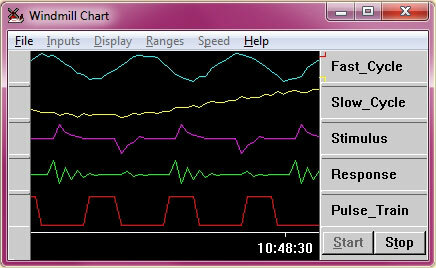 Log data only when channels are in an alarm state, for example when a temperature reading rises above a set point for five minutes. The temperature is regularly logged throughout this time. 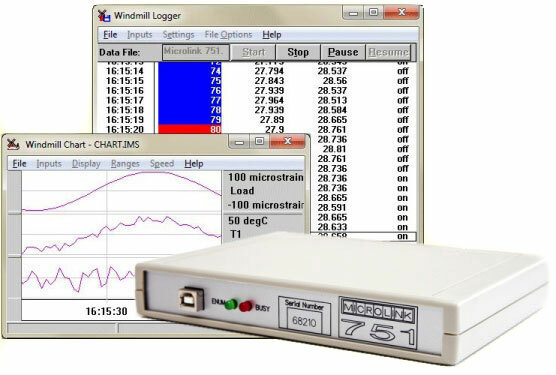 To purchase Windmill on-line visit our on-line DAQ Catalogue. To talk to a salesperson ring +44 (0)161 833 2782, or e-mail [email protected]. We provide free technical support for life and a money-back guarantee if Windmill does not suit you.